Let me just start off by saying that I’m pretty sure I have a reputation for being that person who constantly recommends The Hating Game to literally everyone (it’s pretty much my favorite book ever), so would anyone be surprised to find out that 99 Percent Mine was my most anticipated adult release of 2019? It’s doubtful. The second thing that I want to say is that I never, ever get approved for anything on Edelweiss and I almost cried when I got the email that I’d been approved for this book, so thank you, thank you, thank you. Now, all of that said, I have to say that while I enjoyed 99 Percent Mine, I was a little bit disappointed. I went in expecting to have found my new favorite book, and that was my fault. I really should know better than to hype up books so much in my mind. I don’t think that there’s anything necessarily wrong with this book. There were a lot of things to like: longtime friends-to-lovers, off-the-charts sexual tension, actual communication, characters who aren’t shy about their faults, lovable secondary characters, a whole subplot about underwear… I could go on. I love Sally Thorne’s writing style and I would be lying if I said that I didn’t fall in love with both Darcy and Tom. But there were a couple things that I just couldn’t get over that were problems for me personally, and again, not necessarily actual problems with the book. The first was the constant back-and-forth between Darcy and Tom. This is so common in romance novels and I don’t normally have a problem with it, but I felt like it went on for so long in this book. Darcy and Tom were, in all other ways, so mature and they communicated so well, but the perpetual “should we or shouldn’t we” kind of drove me crazy. The other thing that I didn’t love is that I never felt like we really got to know Tom that well. Sure, he’s perfect, Darcy loves him, he’s the best man on the planet… but aside from that, who is he actually? Everything we know about Tom has been said by another character and we very rarely get to see him in action. In the end, I think it’s fair to give this book three stars. It kind of hurts me to rate it that low, but I also don’t want to fluff my rating just because Sally Thorne is one of my favorite authors. I wouldn’t hesitate to recommend this book to romance fans, but don’t go in expecting another Hating Game. 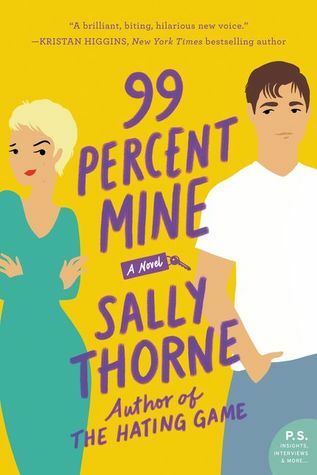 Have you read 99 Percent Mine? What’s your most anticipated release for 2019? Sorry girl! I know how excited you were to get this one too! Those things would bug me too! What a shame it didn’t quite match up to The Hating Game, I think second novels after a really good/ popular first one is quite difficult to match! Amazing review! This is actually exactly what I wanted to know about this book. I haven’t read The Hating Game, but I want to, and I’ve been very torn between whether I should read it first, or just request an ARC of this and read this first. After reading your review, the issues you pointed out are things that always bug me in books, too, so I’m definitely going to read The Hating Game before I read this one just so I can hopefully get a better first impression of the author’s writing! Thank you so much! I would definitely recommend reading The Hating Game first. I love that book so, so much. ❤ I do think that 99 Percent Mine is a good book, it just wasn't really for me. I hope that you love The Hating Game as much as I do!! Sorry for the disappointing read😕. I often don’t read other books written by authors I love because they might not live up to the expectations in my head. But maybe the next book Thorne releases will be better. I still have The Hating Game to get to but I’ll keep expectations in check! I’m sorry this book didn’t live up to your expectations. I know you were looking forward to it a lot. And I do agree with all of your points but I enjoyed the book in spite of all of those things.